Insider Secrets to Successful Freight Brokering: Freight Broker Training: What Is Your Best "Mix"? 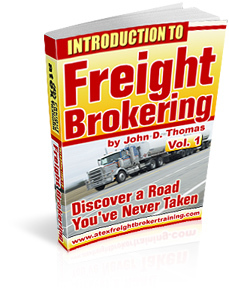 Freight Broker Training: What Is Your Best "Mix"? There are several characteristics that define small businesses and they probably will not change. First, in most small businesses, you might find the owner recording incoming checks, going to the bank, talking to potential and current customers, learning about the latest employee laws and, yes, even taking out the garbage. The big corporations? You won't find too many business owners doing a lot of the work that can otherwise be delegated to others. Smart business owners in larger companies focus on marketing and operating strategies, "making deals", making big decisions and listening to others around them. If you are contemplating starting a freight brokerage, you initially start out doing a lot of things that are not really productive. But they need to be done. The Atex phone/internet training worked great for my schedule, especially because my base is on the East Coast. The workbook is a great resource tool with a wealth of information (literally)!!! Having the option to schedule convenient phone sessions was essential to clarifying anything in the manual that wasn't clear to me as a new broker. I wholeheartedly recommend John and this training module. John is phenomenal!